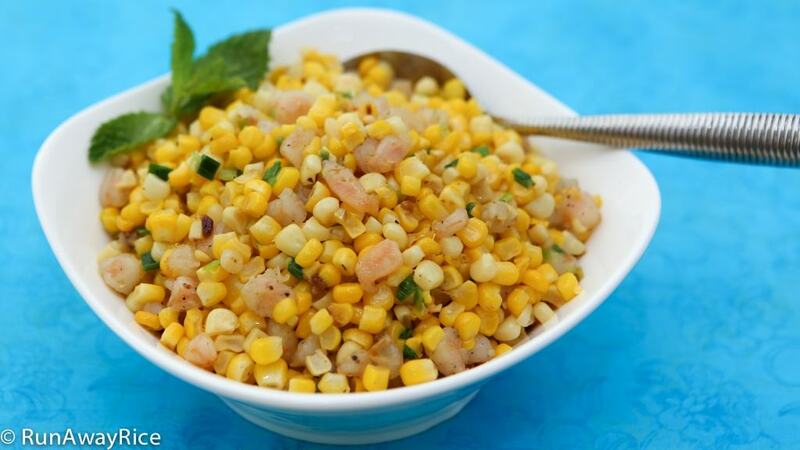 Give your corn dishes a reboot with this Sautéed Summer Corn and Fresh Shrimp recipe. 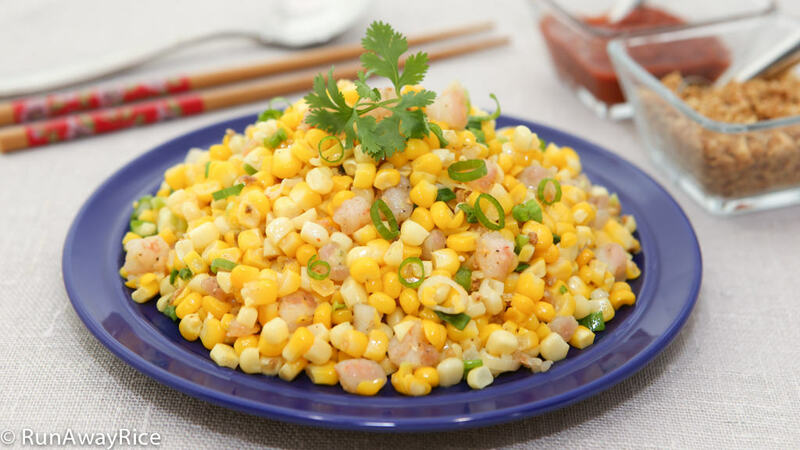 Fresh sweet corn is cut from the cob and then quickly cooked with juicy shrimp, garlic, butter and green onions in a dish that celebrates all the best summertime flavors. This dish is too good to pass up. Super-easy to make, it can be served as a side dish or enjoyed as a quick snack or small meal. Happy Summer Eating! Each ear of corn yields about 3/4 cup of kernels, so the 6 ears yields approximately 4 1/2 cups total. Use any fresh local-grown corn available. I used the yellow corn for its bright and vibrant color but white corn is just as delicious. Depending on where you live, yellow corn may be difficult to find and expensive. 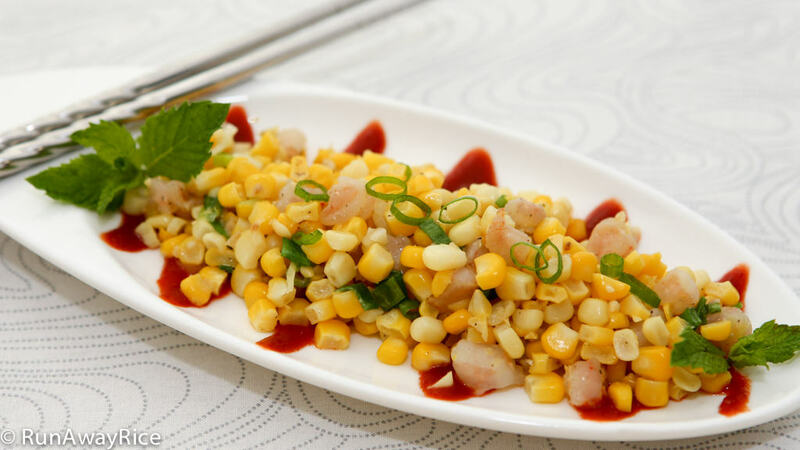 If you can’t find fresh corn, frozen corn or canned corn are good substitutes. This recipe is really versatile. For a twist, try replacing the shrimp with baby scallops, lobster or crab. Yum! Looking for more scrumptious summertime dishes? Check out these posts: Sweet and Sour Pork Ribs (Suon Xao Chua Ngot), Spicy Stir-Fried Crab Legs (Cua Xao Gung Ot), Glass Noodle Salad with Seafood (Goi Mien Tron Hai San), and Asian-Style Beef Short Ribs (Suon Nuong). Cut the shrimp into small pieces. Marinate with minced garlic, 1/4 tsp salt and 1/8 tsp ground black pepper. Set aside for now. Chop the green onions, separating the white portion and the green stems. Remove husks and silk from the ears. Using a corn silk brush, wash the corn under cold water. Pat the ears dry with a paper towel. Trim one end of the corn so it’s flat. Place this end on the base of the smaller bowl. Holding the cob steady, use a sharp paring knife and cut in a downward stroke along the cob to separate the kernals. Continue until all the kernals are removed. Remove the smaller bowl and paper towel. Separate the kernels using your fingers and remove any remaining silk. Heat a large skillet over Medium High heat and spray with vegetable oil. Add the shrimp and toss continuously cooking until the shrimp starts to turn pink, approximately 2 minutes. Transfer to a clean plate. Heat the same skillet over Medium High heat. Add 1 Tbsp butter and the white portion of the green onions. Combine together until the butter is melted. Add the corn and combine together. Cook for 3 minutes stirring continuously. Add back the shrimp and cook until the shrimp is nice and pink, approximately 1-2 minutes. Season with 1/4 tsp salt and 1/8 tsp ground black pepper. Turn off the heat. Add the remaining 1 Tbsp butter and combine until melted. Add the remaining green onion stems and combine together. Sprinkle with the fried garlic and serve with a side of Sriracha hot sauce. Enjoy while hot!